Here are some of my son’s nap time /sleeping time captured in photos. The first two pictures were taken two days apart when Justin was about a month old. The last picture was taken when Justin was 1 year and 7 months old. Of the gentle falling rain. This entry was posted in Mommy Moments, Sleep. Bookmark the permalink. He’s so cute and I love lullabies. My kids also love it when they were still babies. Those are cute pictures. For Evan it was his dad who sang lullaby. Sometimes he just made up his own instead of sang a known one, and surprisingly it worked as well as other lullabies. our little ones loves mom’s voice as they sleep…plus it strengthens the bonding. Ang cute!!! 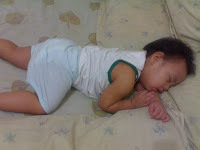 The best talaga sleeping pics, very peaceful at ma-kiss ng walang angal diba? That’s a very nice ritual mommy tetch! Galing na ng baby mo ha? he can now sing with you at just one year and 7 months. i bet he’s a bright boy and he’ll be outstanding as a student. si sam ko naman, i sing to her a lullaby that i made up when it’s sleeping time na. sometimes, she would hum/sing along too.. it sounds really funny kasi nga, inaudible pa yung mga sinasabi nya. of all the songs i sing to my eldest son, he loves the “rainbow connection.” he usually requests for that song before he sleeps. btw, can i add you to my blog? just let me know pls.